Communitech, based in Waterloo, Ontario, is a public-private innovation hub that supports tech businesses as they start, grow, and prosper. Their accelerator program, Fierce Founders Accelerator, is intended to provide companies with tools and resources to scale up their business. One of the program’s eligibility criteria is that the company has at least one female founder. The Accelerator has recently received Ontario government funding, which in turn will support more women-led startups in the tech sector. Communitech’s Fierce Founders Accelerator has received an investment of $264,000 from FedDev Ontario. The Federal Economic Development Agency for Southern Ontario (FedDev Ontario) delivers programs in southern Ontario to help companies grow, foster partnerships, and build solid communities, and also offers personalized support to go-getting and established entrepreneurs and businesses. A personal work space in the Communitech hub. The Accelerator has received $264k in funding for innovation from FedDev Ontario to support women entrepreneurs as they grow their business. This recent funding builds on the $880,000 in previous FedDev Ontario support awarded to establish Fierce Founders in 2016. To date, over 19 women-led startups have been helped, and over 60 full-time jobs have been created. The new funding is expected to contribute to the creation of 10 new jobs. FedDev Ontario delivers programs and services to support economic growth and innovation in southern Ontario and helps new entrepreneurs become investment-ready through seed financing and skills development. Through FedDev’s multiple startup funding streams, businesses can receive repayable contributions from $250,000 up to $10 million per project. FedDev Ontario is now accepting applications for its Business Scale-up and Productivity (BSP) Program, Regional Innovation Ecosystem Program, and Community Economic Development and Diversification Program. While these programs are available to a broad variety of applicant businesses, their respective applications include an option to disclose if the project or organization is led or majority-led by an under-represented group such as women, Indigenous peoples, or visible minorities. The FedDev Ontario Business Scale-up and Productivity (BSP) program helps Canadian companies fast-track their growth by adopting/adapting innovative technologies that support productivity and increased exports to global markets. Businesses can receive a repayable contribution (no-interest loan) of up to 35% of eligible project expenses to a maximum $10 million. 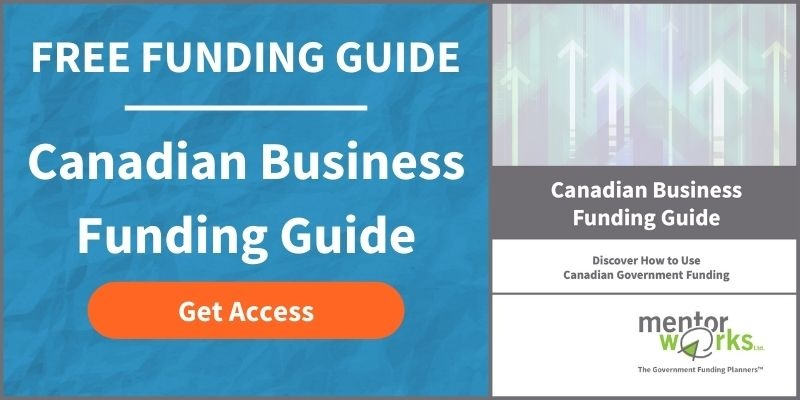 Women-led Canadian businesses interested in learning about additional funding for innovation, please download Mentor Works’ Canadian Business Funding Guide.